LANCASTER – A 21-year-old man was arrested Thursday afternoon after he ran on to a school campus to evade deputies following a dispute with his girlfriend. 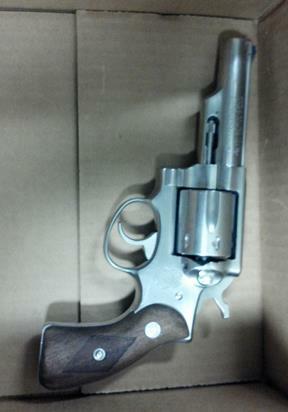 A pistol was recovered where the man was hiding, authorities claim. The arrest happened around 2:30 p.m. Thursday at Bethel Christian School, located at 3100 West Avenue K in Lancaster. Shortly before his arrest, Lawrence Pickett was seen punching his girlfriend in the Antelope Valley College parking lot, which is across the street from Bethel Christian, according to Lancaster Community Relations deputy Miguel Ruiz. When deputies responded to the altercation, Pickett avoided deputies by running southbound across Avenue K and onto the Bethel Christian School Campus, as students prepared to be dismissed, according to Ruiz. Pickett was arrested for possession of a weapon on school grounds and domestic battery. He was booked at the Lancaster Station Jail and held on a $50,000 bond. 13 comments for "Suspect arrested, gun found on Lancaster school campus"
HAS ANYONE ( AV SHERIFFS) CHECKED INTO THE CONNECTION THIS HAS WITH THE GUY THREATENING ON INTERNET ABOUT ATTACK ON AV COLLEGE CAMPUS???? I SUGGEST YOU DO SO RIGHT AWAY. Just an FYI for everyone to know and voice your concern… The deputies assigned to school and are paid for by the school districts do not even show up to the campus until well past 8:30AM. They are at the station doing a brief, then take their time making their way over to the campus…. We have had numerous times we needed a deputy on campus first thing in the morning and had to wait forever to get assistance, and of course we are told to use the “school” deputy and not to use city deputies unless it is a emergency. Ummmmm NO. The security SHERIFFS office is 24 hours on campus and always a deputy there. I work there. Bethel has security gates. My kids felt safe there. This is very sad to think someone would go on any campus with a gun. Thank God for the faculty who helped get this guy and the Sheriff dept. wow no mention that it took the cops 2 1/2 minutes to actually arrest the s###t head. he was detained by a faculty member who spotted the gun. the cops were not so Johnny on the spot with this, except for when there is credit to be had. 2 1/2 minutes is not a bad response time when you have to chase some one across the street and find them in another school whose campus you are not familiar with. Regardless of it being pointed out. The deputies are human too, not superman. It takes time to get things done. That is crazy he got onto a jr college and private school campus….. Those are gun free zones…. They might need a bigger sign that says gun free zone…. That would have kept him from getting onto the campus for sure…..
A. Richards, do you really think a sign is going to stop a armed suspect who is being pursued by the LASD? I think we need a Dome. I sincerely hope is sentence is lengthy. Gutless woman beater! And then he goes to an elementary school with a gun! What a POS.